For new landlords, letting out your property is an exciting experience. It can also, however, be a daunting one when you realise all of the necessary basis you have to cover. And yet, we all have to start somewhere. brightLET Founder & CEO, Camran Khan remembers when he was just a fledgling landlord. Property management unexpectedly fell into his lap when a family illness suddenly left him in charge of a number of rental properties, and he too, went through the trials and tribulations of being a first-time property owner. Camran wishes he had an easy to follow checklist back then. So, we‘ve put one together for you, to make your life slightly easier. Landlords are required to have at least one smoke detector installed in every storey of their rental property, which is used as living accommodation by your tenants. Regulations require landlords to ensure that alarms are in full working order at the start of each new tenancy, otherwise you could face a heavy penalty. Landlords are also required to have a carbon monoxide alarm in any room containing a solid fuel burning appliance and ensure the alarms are in full working order at the start of each tenancy. It's good to note, that gas appliances can also emit carbon monoxide, so it's encouraged for landlords to ensure that working carbon monoxide alarms are installed in rooms with these as well. For more information on this topic, please visit the Gov UK website (click here). By law, all rental properties must have access to escape routes at all times, fire-safe furniture and furnishings, fire alarms and carbon monoxide detectors. How do you know if something is fire safe? The label will have a black symbol of lit cigarettes and matches on it. All furniture purchased after 1988 should be fire safe, but check the permanent label just to be sure. If you can‘t find a label on the furniture, your best bet is to replace it. Better safe than sorry! Landlords need a valid EPC (Energy Performance Certificate) to let a property, and must give a copy of the certificate to tenants at the start of a tenancy. An EPC gives a property an energy efficiency rating from A (most efficient) to G (least efficient) and is valid for 10 years. It is good to note, as of April next year (2018), you won't be able to let a property or renew an existing tenancy if the property in question has an EPC rating of below E-. 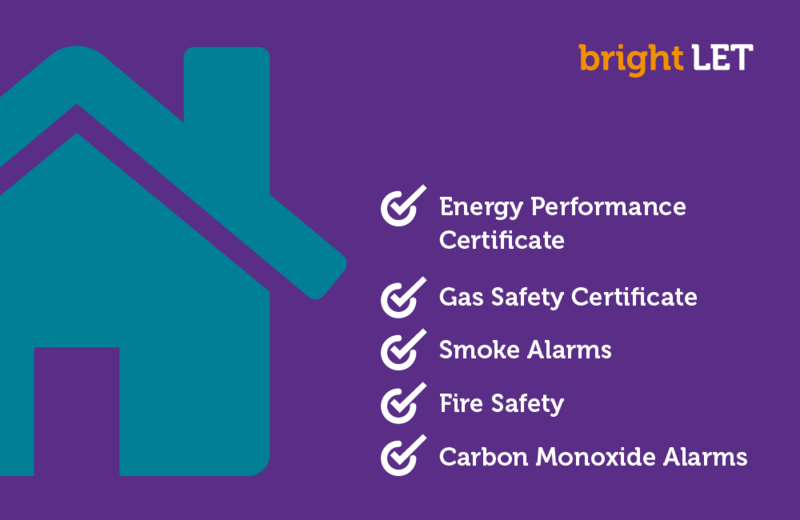 If you have any gas supply at your rental property, you must do a gas safety inspection each year and supply your tenants a copy of the certificate at the start of a tenancy. By law it‘s your responsibility to get a valid Gas Safety Certificate every twelve months. You must get the Gas Safety Certificate from a registered gas safe engineer for all pipe work, gas appliances and flues installed in your property. Portal Appliance Testing (PAT) is the examination of electrical appliances and equipment to ensure they are safe. Most electrical safety defects can be found by visual examination but some types of defects can only be found by testing. It's a good idea to keep record and label any appliances tested for electrical safety so you can monitor and review the effectiveness of the maintenance scheme. For more information on electrical safety, please visit the HSE website (click here). We often come across Landlords renting out first time buyer mortgaged properties - this is not allowed! If you are planning to let out this type of mortgaged property, then seek permission from your mortgage lender. Alternatively, change the mortgage over to a buy-to-let mortgage. Note: Make sure the mortgage is a buy-to-let and the lender is aware of you renting it out. Also known as Landlord Insurance, this type of insurance typically includes building insurance to cover against events such as fire, flooding and subsidence. Note: this won‘t cover items such as furniture, for that you will need contents insurance. Last but not least, check your insurance policy and read it carefully before taking it out. Landlords should advise tenants to purchase renters insurance since they are not covered under your insurance policy. Cover any holes in the walls, scratches on surfaces, and any other aesthetical fixes. So, there you have it, our recommended list of things to tick off before renting out your property. Hopefully this list will help you start your buy-to-let journey smoothly and successfully. If you have any recommended points to add, questions or comments, please feel free to get in touch with us by clicking here. In our next post we will be discussing some further legal obligations before renting out your property to a tenant. Watch this space!